After I got injured my heart stopped and I flatlined. I was done and gone. But I wasn’t alone. There was something waiting for me when I died. Something dark and cold tried to take my soul away. Jane is no stranger to life threatening accident. She has almost died many times, she was even born dead. Everybody at school calls her and her best friend Lexi the Creep Sisters, but Lexi is the only one who understands Jane’s secret. Her shadow is out to get her. Her shadow has pulled her into so many dangerous situations and now, its starting to take form. Things are getting more and more dangerous for Jane and when her and Lexi discover something that could possibly link her shadow to another persons death they take on more than they ever expected. I’m a sucker for ghost stories. I will read anything and everything ghost or thriller related if I can so when I heard about Beyond I jumped at the chance to read it. With the tagline ‘If Stephen King wrote YA…’ I wasn’t concerned about whether or not I’d enjoy the book, I just knew I would. That tagline is pretty bold and if I’m brutally honest Beyond doesn’t really compare, but it is a great, creepy story. I loved the storyline and how odd it was, with Jane’s shadow having a mind of its own and making her take freaky trips out while she’s sleeping. On more than one occasion I truly feared for Jane’s life and the suspense was often unsettling. The book is short at 250 pages, with large well spaced out font so I read the entire thing in a matter of hours. If not often I read an entire book in one weekday, even one this short and to be honest I read it so quickly because I needed to know what was going to happen, I needed to be there with Jane when she discovered things and I needed to make sure she was ok. The book does have its terrifying moments, especially when you learn what Jane’s shadow has made her do in the past and her and Lexi’s theory on why. I really enjoyed the characters and the dynamic between Lexi and Jane was brilliant, you could tell that they were almost like sisters, both only children in a small town where they were considered different, the pair were made for each other. I loved Lexi’s humour and her free spirit and the way she bought the best out of Jane. Jane’s parents were nice and to be honest, just annoying enough to be considered real parents, not overly friendly but not too distant. I really loved the relationship she had with her dad. other characters were odd, I didn’t like Max at all and thought he was pretty stalkerish. Jane’s shadow can pretty much be considered a character but I don’t want to say much about it other than it’s so freaky! I honest really enjoyed this book and I think any sucker for ghost stories needs to read it. I didn’t consider it terrifying and managed to finish it just before bed and had no nightmares, but I don’t scare easily. I think most teens will enjoy Beyond and its definitely a must for more reluctant readers if they can be swayed into reading a ghost story! 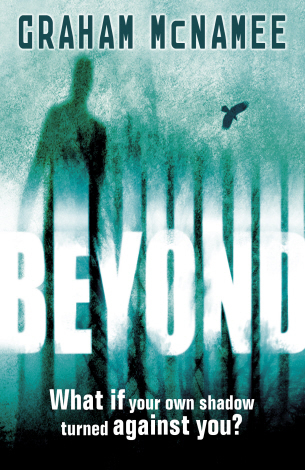 Beyond will be published on January 3rd by Hodder Children’s Books. My copy was sent in exchange for an honest review.